Here is a guide to publishing apps in the App store. We have put together a great list of Hot Niche Segments. Here is a guide about Joint Ventures. Here are some nice fonts to add to your computer. WHAT DO YOUR CONTRACTS LOOK LIKE? WHAT DO YOUR INVOICES LOOK LIKE? This is a work for hire agreement between Great Web Ideas, LLC (“Company” or “We”) and Customer (or “You”). This is an agreement for a Business Website Package, Social Media Package, App Development, Hosting, Email Marketing or Video Production, or Local Search Placement services and/ or Web Development. This agreement may include, but is not limited to, hosting, maintenance, website development, pay-per-click advertising and all other ancillary services that Great Web Ideas, LLC may offer. Great Web Ideas, LLC agrees to provide Website services as an independent contractor in accordance with the terms set forth below. By signing, You agree to all of the terms contained in this contract for services, and this agreement shall become effective on the date (“Effective Date”) that payment is accepted and received by Great Web Ideas, LLC. i. Website Analysis: To check the current status of your website. ii. Keyword Finder: To help find powerful keywords. iii. Automated Submissions to search engines for site indexing once or twice a month. iv. Manual submission to major search engines. v. Top 10 results on the Local Business Search. vi. Ongoing support and maintenance after 60 days. Great Web Ideas, LLC does not guarantee any increase in traffic or sales to Customer in providing this service Great Web Ideas, LLC also does not guarantee any exact placement in any search engines. This service specifically excludes pay per click advertising and anything not specifically enumerated in this contract. Great Web Ideas, LLC is not liable for any loss of ranking to Customer. Further Great Web Ideas, LLC is not liable for any other changes or issues caused by other search engine optimization companies or by the customer. In consideration for the Website and Marketing services contemplated by this agreement, Customer will make payments to: Great Web Ideas, LLC as described in this section. All sales are final, and Great Web Ideas, LLC offers no partial or full refunds. Payment: Customer will pay Great Web Ideas, LLC for a one-time fixed setup fee and then a monthly maintenance fee. Customer agrees to a minimum of six months of maintenance, and will be billed on a month-to-month basis thereafter. Migration or moving your website to another service will require a payment of $80. Hourly rate after the 3 month support period (after the Standard Support period) will be billed at the rate of $65/hour. All amounts are in U.S. Dollars. 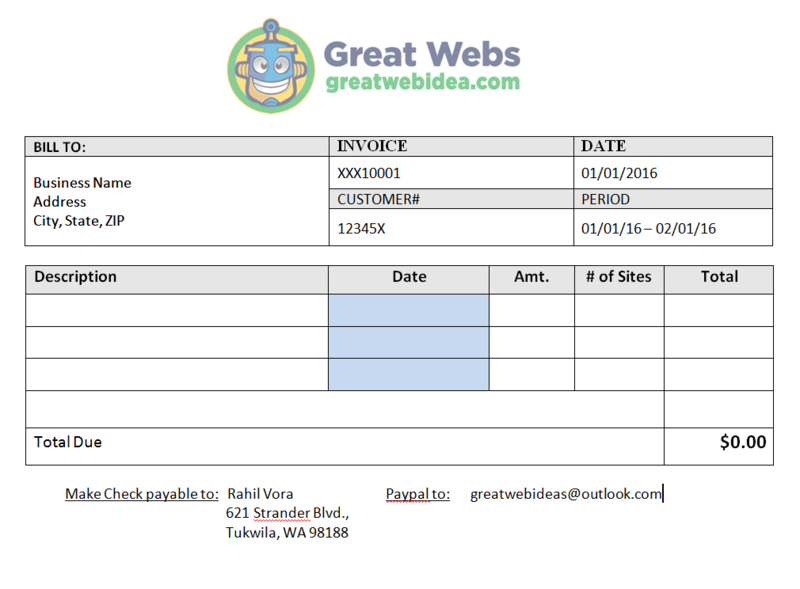 Payment Schedule and Late Fees: Great Web Ideas, LLC will invoice the Customer monthly, and all payments are due within five (5) days after submission of invoice. If a payment is returned or rejected by our bank, Customer shall pay us a service fee of $40 and reimburse all additional fees and costs incurred by us. Customer may also be deemed to be in Default (See Section 4 of this Agreement). Change in Fees: Great Web Ideas, LLC may change its fee schedules on sixty (60) days notice by postal mail and/or electronic mail. Upon such notice, the Customer shall have thirty (30) calendar days prior to the effective date of the fee schedule to notify us by certified postal mail and/or electronic mail if Customer does not agree to such a rate increase and that Customer wishes to terminate this Agreement. 4. Taxes: Customer will be responsible for all taxes associated with Services contemplated by this agreement, and taxes will be in addition to the rates quoted. Great Web Ideas, LLC’s Service Agreement Taxes: Customer will be responsible for all taxes associated with Services contemplated by this agreement, and taxes will be in addition to the rates quoted. If a payment by Customer is returned or rejected by Great Web Ideas, LLC’s bank, Customer shall be immediately deemed to be in default of this Agreement. Accounts not paid in full by the tenth day after Great Web Ideas, LLC submits its invoice may have service interrupted or terminated; interruption does not relieve the Customer from the obligation to pay all fees due to Great Web Ideas, LLC, including the monthly account charge. Accounts and all amounts in default are subject to a late payment charge of 1.5% per month, or the maximum amount permitted by law, whichever is less, until fully paid. Customer also agrees to pay Great Web Ideas, LLC all of its reasonable expenses, including attorney and collection agency fees, incurred in enforcing its rights via a Customer default. Customer may not resell or license any of Great Web Ideas, LLC’s Software or Marketing Services to any third parties without the prior written consent of Great Web Ideas, LLC. For example, Customer may not provide Website or Marketing services to any third party without Great Web Ideas, LLC’s prior written consent. This is a material breach of this Agreement and releases Great Web Ideas, LLC from all obligations associated with this Agreement. Ask your Website representative about our Optional Re-sellers Program. See Optional Re-seller Agreement. As part of this Agreement, Customer grants Great Web Ideas, LLC a non-exclusive right and license to use Customer’s business names, trade names, trademarks, and service marks (collectively, “Customer’s Marks”) (a) on Great Web Ideas, LLC’s own Web Sites, (b) In printed and online advertising, publicity, directories, newsletters, and updates describing Great Web Ideas, LLC’s Services, and, (c) in applications reasonably necessary and ancillary to the foregoing. Customer may use Great Web Ideas, LLC’s trade name, trademarks, and service marks (collectively, ” Great Web Ideas, LLC’s Marks”) in advertising and publicity in conjunction with the offering of Customer’s content, provided that the Customer shall submit a copy of all such use to Great Web Ideas, LLC for its prior written approval, and provided further that under no circumstances shall such use imply that Great Web Ideas, LLC endorses, sponsors, certifies, approves or is responsible for Customer’s content. Notwithstanding the foregoing, the Customer need not obtain Great Web Ideas, LLC’s prior written approval where use of Great Web Ideas, LLC’s Marks is limited to inclusion in a list of systems via which Customer’s content is available. Term: This Website and Marketing Services Agreement shall begin on the Effective Date and shall continue on a month-to-month basis, until either Party gives the non-terminating Party Thirty (30) days written notice of its election to terminate this Agreement. Termination: Termination of this Agreement by Customer must be in writing. Please notify us of your intent to terminate by registered post or electronic mail, receipt requested. Telephone cancellations will NOT be accepted. Upon termination by Customer, everything related to Search Engine Marketing that is stored on our servers may be deleted. Cancellation will not entitle Customer to a refund of setup fees, and will not offer any relief of your obligation to pay the remaining balance of your account. However, if you cancel within 30 days of purchasing an Great Web Ideas, LLC Package and would like to transfer to a different service we offer (for same or lesser value), we may, at our option, apply the purchase price to a website credit for your Great Web Ideas, LLC account. Migration or moving your website to another service will require a payment of $80 (if requested after 90 days from your closing payment on the contract). All amounts are in U.S. Dollars. Material Breach: Each Party shall have the right to terminate this Agreement upon Thirty (30) days prior written notice if the other Party is in material breach of any term of this Agreement, including without limitation the payment of monies, and the breaching Party fails to remedy such breach within the fifteen day notice period. Acceptable Use Policy: Great Web Ideas, LLC maintains on its Web site an Acceptable Use Policy (“AUP”). Customer agrees to abide by the AUP. Great Web Ideas, LLC may modify its AUP at any time, and shall post the then-current AUP on its Web site, to be effective upon posting. End Users to Comply with AUP: Customer acknowledges that Great Web Ideas, LLC may terminate an end user’s access to Customer’s Web Site for noncompliance with Great Web Ideas, LLC’s AUP. Great Web Ideas, LLC may thus terminate such end user’s access to Customer’s content even if the end user has not violated the Customer’s own terms and conditions of use of its web site. 9. Customer Content You, the Customer, acknowledge and agree that you are solely responsible for ensuring the integrity of your content. Although Great Web Ideas, LLC provides data backup services, the Customer is advised that Great Web Ideas, LLC in no way is responsible for any damages resulting from the loss of your content, regardless of the reason for such loss. We encourage you to backup and archive your content regularly. 10. Indemnification and Warranties INDEMNIFICATION: Customer shall indemnify and hold harmless Great Web Ideas, LLC from and against any and all claims, demands, actions, causes of action, suits, proceedings, losses, damages, costs, and expenses, including reasonable attorneys fees, arising from or relating to the Customer’s provision, or an end user’s use, of Customer’s content, or any act, error, or omission of the Customer in connection therewith, including, but not limited to, matters relating to incorrect, incomplete, or misleading information; libel; invasion of privacy; infringement of a copyright, trade name, trademark, service mark, or other intellectual property or other right; or violation of any applicable law. WARRANTIES: We do not make warranties of any kind following the 3 months of Standard Website Support as described in our contract. Great Web Ideas, LLC does not warranty against malware or a “warning” message appearing on Google or other search engines that indicate any website we made may harm your computer. We will remove any such aforementioned warning within 4 days however as a courtesy for a 3-month period following your closing payment of the contract you signed. After this, the website is delivered “AS IS” with no warranty, free support, or technical support by Great Web Ideas technicians. Once any other technician, or client has been given “Administrator” credentials for their WordPress website, there will be no remediation or technical support for the website or service. THE SERVICES PERFORMED AS WORK PRODUCT UNDER THIS AGREEMENT IS PROVIDED ON AN “AS IS” BASIS, WITHOUT ANY OTHER WARRANTIES OR REPRESENTATIONS EXPRESS, IMPLIED OR STATUTORY SUCH AS ANY WARRANTIES OF QUALITY, PERFORMANCE, NONINFRINGEMENT, MERCHANTABILITY OR FITNESS FOR A PARTICULAR PURPOSE. NOR ARE THERE ANY WARRANTIES CREATED BY A COURSE OF DEALING, COURSE OF PERFORMANCE OR TRADE USAGE. Great Web Ideas, LLC DOES NOT WARRANT THAT THE WORK PRODUCT WILL MEET CUSTOMER’S NEEDS OR IS FREE FROM ERRORS. THE FOREGOING EXCLUSIONS AND DISCLAIMERS ARE AN ESSENTIAL PART OF THIS AGREEMENT AND IT IS AGREED THAT THEY FORMED THE BASIS FOR DETERMINING THE PRICE CHARGED FOR DEVELOPMENT OF THE WORK PRODUCT AND OTHER SERVICES TO CUSTOMER SET OUT IN THIS AGREEMENT. Assignment: The rights and obligations under this Agreement are freely assignable by either party, provided however, in the event Customer assigns its rights under this Agreement to any third party, Customer shall continue to have the obligation to (i) pay Great Web Ideas, LLC if the third party fails to pay as required by this Agreement, and (ii) indemnify, defend and hold Great Web Ideas, LLC harmless as required by this Agreement. Backup and Firewalls: Customer is solely responsible for the proper backup and protection of all of its software and data, as well as the implementation and maintenance of appropriate firewalls and security measures (including proper virus control) in connection with the use and operation of the Customer’s computer facilities. Entire Agreement: This Agreement contains the entire understanding of the parties regarding the subject matter of this Agreement and supersedes all prior and contemporaneous negotiations and agreements, whether written or oral, between the parties with respect to the subject matter of this Agreement. Mutual Non-solicitation of Employees: Customer agrees not to hire or solicit employees of Great Web Ideas, LLC during performance of this Agreement and for a period of twelve (12) months after termination of this Agreement without our prior written consent. Similarly Great Web Ideas, LLC agrees not to knowingly hire or solicit Customer’s employees during performance of this Agreement and for a period of 12 months after termination of this Agreement without your prior written consent. Severability: If a provision of this Agreement is determined to be unenforceable in any respect, the enforceability of the provision in any other respect and of the remaining provisions of this Agreement will not be impaired. Signatures: This Agreement may be signed in counterparts. A fax transmission of a signature page will be considered an original signature page. At the request of a party, a party will confirm a fax-transmitted signature page by delivering an original signature page to the requesting party. Termination: The termination of this Agreement, regardless of how it occurs, will not relieve a party of obligations that have accrued before the termination. * There is a 3 day money back guarantee on both the Websites, Apps and the Marketing (SEO) Products. This also includes the Local Search Program and Social Media Program. The guarantee begins the day the Purchaser signs or accepts the agreement and or consideration is made. If the Purchaser wishes to exercise a return for a refund, simply contact us in writing by certified mail to: Great Web Ideas, LLC, 621 Strander Blvd., Tukwila, WA 98188 return via private overnight courier (so you will have record) within 3 days of signing or accepting the agreement. It is strongly recommended the Purchaser both EMAIL (greatwebidea@gmail.com) and email the notice of the intent for refund of the service or product within the 3 day period. * All sales are final and set-up fees are non-refundable. We do not have a Satisfaction guarantee offered on our Web Design, Web Development or App Development Services, please contact customer support at 206-451-3538 for complete details.